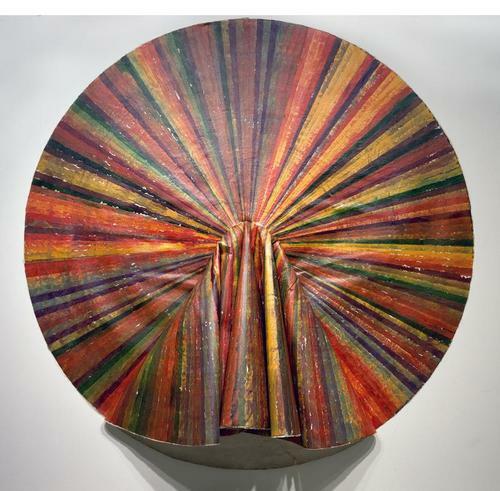 Jean-Baptiste Audat’s work is presented in the form of two circular free canvases with one of the surfaces covered with strips of coloured paper. 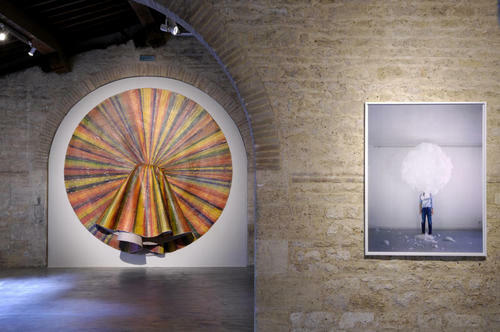 One canvas is fixed to the wall, the other (which is only held by its central part to the one attached to the picture rail) falls, forming an interplay of folds in space. For several years the work has shown a process of deterioration because of the impossibility of storing it and satisfactorily handling it. Folds, cracks, a yellowing of the rendering, and a loss of cohesion in the work’s structure can all be observed. The artist Jean-Baptiste Audat undertakes the restoration proposed by Françoise Martin Dareths and Tiziana Mazzoni (DMF-certified restorers). With the help of an iron (set low) and a length of mylar (protection film), the restorers have ironed out the folds starting from the centre and working outwards, consolidated the tears, and lined each canvas with the help of a synthetic canvas.